Maybe a bunch of pancakes isn’t such a bad thing? I know there’s nothin’ bad at all about a Puffy Pancake, for instance. I mean, c’mon: crisp edges, soft, custardy center, sprinkled with powdered sugar that just kind of melts into that warm deliciousness! And then a good squeeze of lemon, maybe some berries? Honestly, I wish I had one right now, but they’re best made and served right from the pan. All that drama of that glorious pancake brought to the table and laid down like an offering…it’s a shame it’s such a fleeting thing. My first, ever Puffy Pancake, made long before I knew they were credited by the New York Times to David Eyre (where did he get the recipe from?) was served to me by my Stepmom, Pat. Pat, who was from California and had all kinds of “ideas” and this was one of the best. Now, I’m serving them to her, so we’ve come full circle. She made them, and so did I, for years in a glass Pyrex pie plate. Then somewhere along the line I started using my trusty 12″ cast iron pan. The one my Mom gave to me when I went off to college – which makes it over 40 years old! Today, on a whim, I used my newer-fangled 10″ enameled cast iron. I’m telling you, a 10″ is the way to go, here. This Puffy Pancake could hardly be cheaper to make – watch what you serve it with if you want to come in at a budget. Berries are probably one of the priciest of the seasonal fruits and admittedly a splurge. Jams & Jellies are generally at their least expensive just a few weeks after harvest – look for sales & coupons starting around now & stock up. Makes sense, because the warehouses are full. Place a 10″ or 12″ cast iron pan in oven. Preheat oven to 425 degrees. While the oven and pan preheat, in a mixing bowl, beat the two eggs. Add in the flour & milk and whisk until incorporated with just a few lumps remaining. When preheated, remove pan and add butter. Swirl until butter melts, then immediately add the butter and place pan in oven. Bake for about 13 – 15 minutes until the pancake is puffed, golden brown around the outside and looks nearly dry in the center. Working quickly, remove pancake and sift the powdered sugar (using a fine sieve) over it, then return it to the oven for another 1 – 2 minutes. Sprinkle pancake with lemon and serve immediately with desired accompaniments. I’m toting this recipe over to Angie’s Fiesta Friday #185, hosted this week by Suzanne @ apuginthekitchen and Monika @ Everyday Healthy Recipes. I encourage you to take a second or two, click over to the party and see what it’s about. Angie has one of the most amazing link ups and it’s so much fun to see what the bloggers are making each week. David Eyre’s Pancake; this was one I made some time ago. This entry was posted in Click here for Bargain Meals, Click here for Fabulous Food Posts and tagged Bargain Meal of the Week, Breakfast or Brunch Dish, david eyre, Eggs, Frugal Hausfrau, milk, new york times. Bookmark the permalink. As we are a Dutch-American household we love this and always call it a “Dutch Baby”…one of my favorite things to eat. Great images. Thanks, Teresa! I love that term – I should have called it that but I think somewhere along the line forgot. We had some Dutch neighbors who used to sometimes call us over when we were outside playing and feed us treats and chat us up!! They were so lovely! Getting a comment from you is always like getting a hug! 🙂 You are the best! 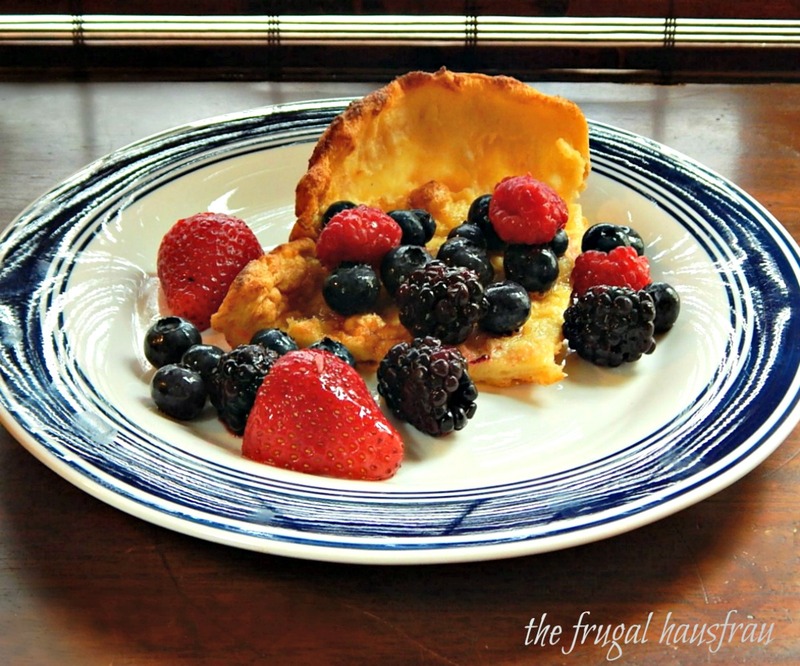 Love a puffy dutch baby pancake. I have been looking for a good recipe, the one I made is ok this looks great. I Will make this puffend pancakecasva Nice brekkie tomorrow moring,…Ooh yes! Nom nom! You are the BEST, Sophie!! Cast iron skillet cooking is always so much fun, isn’t it? I am also making a cast iron skillet dish for today’s blog. Thank you for the inspiration as always! It is, and I do love my cast iron – it gets heavier every year, though! !